The Magic Lantern Society and the University of Westminster have organised a series of talk and events to be held at the University of Westminster’s central London site at 309 Regent Street, which was formerly the Royal Polytechnic Institution. 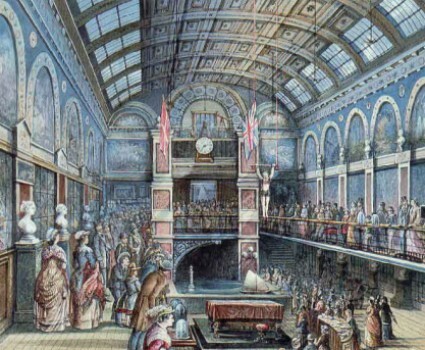 For much of the nineteenth century the Polytechnic was London’s leading centre for the popularisation of science, hosting lectures, lantern shows, scientific demonstrations, and – on 20 February 1896 – the debut of the Cinématographe Lumière in Britain. Visual technologies and performance were a stape attraction of the Polytechnic, and it is in this spirit that the series is being presented, under the name of one of the most popular of contemporary stage illusions, Pepper’s Ghost. This invention of ‘Professor’ John Henry Pepper, a director of the Polytechnic, this simple but ingenious illusions whereby ghostly figures could appear on stage was the subject of an earlier post, after its unexpected use in a Paul McCartney pop video. celebrate the spirit of the old Polytechnic featuring rarely-seen London-based historical material, physical demonstrations of “lost media” and surprisingly new applications of ancient optical techniques by contemporary visual artists, stage performers, filmmakers and designers. Jeremy Brooker provides a guide (both virtual and actual) to the Royal Polytechnic’s famous optical theatre. Dr David G. Burder offers a ‘sensational’ guide to the art and history of seeing things in 3-dimensions. Photographer and video artist Simon Warner looks at the work of Daguerre and the Diorama phenomenon in the 1820s and 30s. Professor Vanessa Toulmin presents an illustrated and astonishing look at the wide range of ephemeral entertainments which captured the public imagination of visitors to London in the 19th century, drawing on rarely-seen flyers and bill material in the National Fairground Archive. Freelance illustrator Geoff Coupland showcases his own work and that of his students from the Camberwell College of Art applying what are often referred to as 19th century and earlier ‘dead media’ forms such as the magic lantern, shadow-play and flickbooks, to illustrate modern ideas and points of view. In this unruly entertainment ‘Professor’ Mervyn Heard highlights some of the more bizarre, surprising and often horrifying lantern ‘entertainments’ of the 18th, 19th and 20th centuries and attempts to prove that, in the right hands, ‘the lantern lecture’ could be much more than a naive precursor to cinema: instead the basis for inspired live performance. The prize goes to Professor Vanessa for the catchiest title, but all sound enticing. All the lectures start at 7pm, and admission is free, with tickets issued from 6pm. For further information, visit the University of Westminster site.